Tomorrow marks just one week to go until Doctor Who returns to our screens, bringing with it a brand new era for the show. 15 months since Jodie Whittaker was unveiled as the Thirteenth Doctor, we’ve still yet to see a substantial amount of her in action. In fact, the 2017 Christmas special only saw her utter one word and the trailers so far have just given us a few snippets. But now, the BBC have supplied us with our first proper clip from the upcoming season premiere, titled “The Woman Who Fell To Earth,” giving us a whole minute of Whittaker in action as the latest version of the Time Lord. And, wouldn’t you know it, she’s instantly brilliant in the part. The clip teases that Thirteen will be suffering from some post-regenerative amnesia in the episode, meaning she won’t immediately know who she is. The clip also features the Doctor’s new companions, Yaz Khan and Ryan Sinclair (played by Mandip Gill and Tosin Cole). It reveals that Yaz is a police officer as she tries to stop the forgetful Time Lord from intruding on a crime scene in a train. We’re not sure what Ryan’s doing there, though, but we can at least rule out the option that he’s a doctor. Not featured in the clip is Bradley Walsh’s Graham, who’s the fourth and final member of the new TARDIS team. 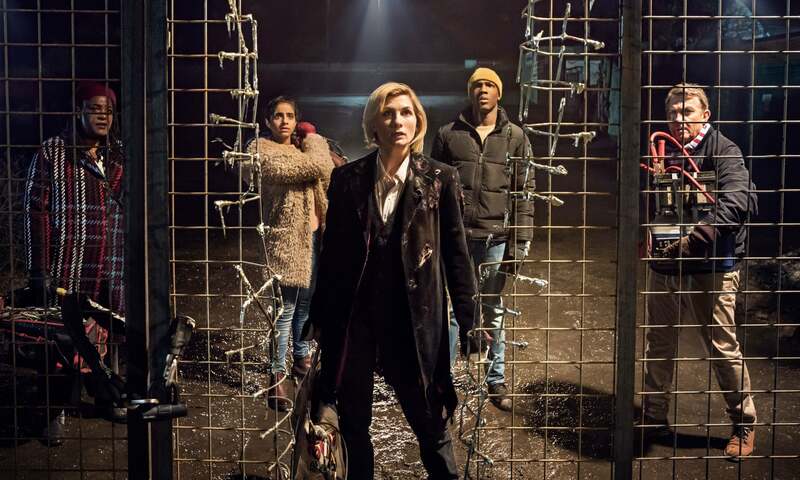 He can be seen, alongside recurring character Grace (Sharon D. Clarke), in a recent promo image (above) that seems to be set at a similar part of the episode to this – note that Whittaker’s still wearing Capaldi’s inherited clothes – so they’ll likely meet soon after this sequence takes place. Either way, all will be revealed next Sunday, October 7th, when Doctor Who “The Woman Who Fell To Earth”… falls to Earth.